This robust rear mounted bike carrier features long dual arcing tubes providing greater clearance over rear spoilers and maximizing the amount of vehicles it can work with. Also available in a 2 bike model. 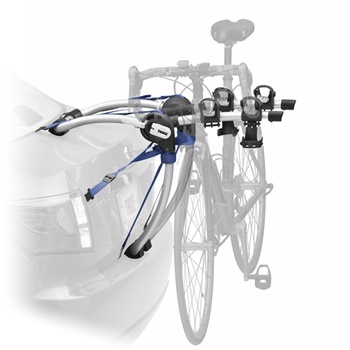 Capable of locking bikes to the carrier with the Thule Cable Lock 538XT adaptor (SOLD SEPARATELY). Strap Management Device contains excess straps to help protect vehicle finish.